Customise any plan to meet your exact needs and budget. Upgrade, Downgrade or Adjust any plan at any time. No long term contracts, no sign-up fee, no termination fee, pay as you go, Cancel at any time. Simplify Meeting Room Reservations. 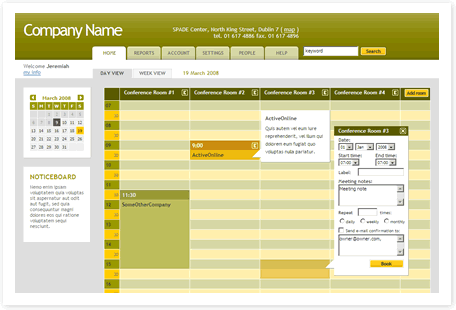 Instant booking of meeting rooms, conference rooms, studios and other facilities. Self Service. Allow self-service booking by all staff or/and clients and reduce administration overhead and costs. Eliminate Double booking. Real time availability checking and booking removes the potential for scheduling conflicts. Generate Reports. Track room utilisation, by person, dept, company and user. Generate itemised usage and cost reports. Total Control and Security. Comprehensive rights management and administration controls. Easy to use and intuitive. Take two minutes to look at a few screen shots to see how easy to use our room booking service is. These are the questions that you may need a quick answer for..